This entry was posted on January 22, 2008 at 5:55 pm	and is filed under Quake 3 C++ .NET Port. You can follow any responses to this entry through the RSS 2.0 feed. You can leave a response, or trackback from your own site. Awesome, Greg! Will you be porting it to C#? 🙂 I’ve tried compiling the solution and have bunch of this kind of errors, what I’m doing wrong? C# port? I have thought about it. 😉 It would take a really long time; so I haven’t decided yet. About the errors – that’s really weird since assert.h is a standard system header. Is that the very _first_ error you get? If not, what is? Sounds to me like that error is a side-effect of something bigger. Are you using the Express version of VS 2008 or Professional? If you comment out the include, then do you get other headers not found, or is it OK after that? This is awesome! Dude, you’re the man. C#? What’s the point unless you’re re-architecting the q3a codebase to use C# language features? This is way cool as is. Why C#? Yeah, I know it’s pointless considering with this port you can now use all the .NET classes and do everything that C# can do (albeit with a different syntax). But I don’t know why, I just think it’d be kind of cool to see a C# version running side by side with a MC++ version. What are the performance penalties of managed execution? Can you give us some numbers? Kirill — I did the port on a high powered gaming PC making it hard to get meaningful numbers. Both versions run at the max vsync rate (my monitor is 60Hz, so I get 60 fps). I will try them on a couple slower machines within the next few days to get some relevant performance stats. Stay tuned. Well, not really. As of the 2008 release, C# can do expression trees and lambdas, but C++/CLI cannot, to my knowledge. However, for the purposes of this project, it’s *probably* a very minor thing unless there are sections of code that do some interesting queries of collections. I don’t know which version you used, but I hope it wasn’t id’s original source. icculus.org hosts a version with a metric boatload of bugfixes (and some new features), not having them included would be… bad. The point of moving to C#? Get it to C# then swap out the DX calls with XNA ones and publish it to the XBox 360, that’s why. Should be a matter of getting the compiled assemblies, opening them up in Reflector, dumping the code out in C# and fixing any weirdness (which will be a LOT easier than the 28,000 errors you had before). Trust me, I’m doing the same thing with the original Sim City code as it moves to XNA. Great job on the port! Looks fab. Theoretically, if you ported it to C#, couldn’t you then port it to asp.net? Why don’t you just turn off the vsync? You can do this in your video drivers. I believe Quake 3 has a com_maxfps as well that you need to disable (set it to 0 I think? Or something high). Then just do the standard timedemo. My stomach had an explosion with happiness!! At first it may seem weird that the .NET version is slightly faster, but remember, the original commercial quake3.exe uses its own custom interpreter to run QVM files responsible for all of the game logic (except rendering of course). My .NET port uses DLL’s also _interpreted_ by the .NET framework instead of QVM’s. So what you’re really doing is comparing who’s interpreter is faster. Miguel – When did the name change? Thanks for the info. I didn’t know that. Do you know if VC++ will support those features in the future? I used the v1.32 source that is in the technology downloads section of Id Software’s site. I don’t think this is the “bad” version you’re talking about. It’s the same version released to stores under the Ultimate Quake Collection. The CHANGELOG lists numerous bug fixes and was last updated on 5/22/2004. I think Baczek is right, ioquake is the same q3a engine you used but with fixed a lot of bugs, and added a lot of extras to made it more compatible. Thanx for your excellent work. Bil – very good point indeed! Adam – no, ASP.NET is used for web development. What is the purpose of such a port ? why not keeping it native ? Do you want to add plugin in c# ? I wonder how difficult it would be to stick an XNA overlay HUD on top of the scene? In any case, I’ll have a fun weekend tinkering around with the bot AI while its 14 degrees outside. The purpose – well, it started out as something just for fun. I like to do things that are hard in programming. I’m the kind of programmer where if my ballpoint pen had a 2Hz CPU with 4 transistors and 8 bytes of RAM, I’d try to write an OS for it. LOL! After my initial porting efforts started to work where I had a C++ version without CLI, I began messing around with some of the in-game weapons. I made a few simple mods with the rocket launcher and shotgun – it became really fun and at that point I realized most mods don’t need to be C or C++, a managed language would be more than adequate to code these parts of the game without having to worry about performance. Furthermore, development time typically shrinks as a result of using a .NET language over C or C++. This means new features can be coded quicker and with less of the idiosyncrasies common to native C.
After pondering things for a while, I decided to go all out and convert the entire codebase to C++/CLI. So to answer your question, yes, I have things I want to write in C# but more importantly there are things I want to try in _some_ .NET language, it doesn’t necessarily have to be C#. Why not go pure clr? I contemplated that question for a long time actually. At first I looked at it from the perspective of writing a game from scratch; I asked this question – if you had started writing a game from line zero and it had to be .NET, would you use pure or mixed-managed? My first answer was: go with pure. But then I thought some more – given that FPS games are highly performance driven and you must squeeze every last ounce of power from the CPU – going with pure would be a bad decision. You want the performance gains from doing mixed-managed. In the end, everything will still turn into 100% CLI bytecode anyway. Thanks for your answer, I understand better your approach. I think too that to add some additional code (weapon as you said for example), it’s easier to do it with another .net language. In this way, I understand why you try to port the code. (and for your pleasure too 🙂 ). Then name changed from Managed C++ Extensions (which everybody abreviated to Managed C++) to C++/CLI, right about when VS2005 came out, I think. Awesome! Glad you’re really liking it!! 🙂 As far as adding XNA, take a look at win_qgl.c in the “renderer” project. You’d have to change those functions to their XNA equivalent. I know things are done much differently in OpenGL versus XNA, buy hey, no one said it was going to be easy. 😉 Or you can try and figure out how to make an OpenGL rendering context work in tandem with the XNA’s GraphicsDevice object. Then you wouldn’t need to convert everything, just the functions you needed. Here’s something you can try: have OpenGL render to the back buffer like normal but instead of flipping it to the screen, read the raw buffer data with glReadBuffer() and glReadPixels(), then use that data to fill in XNA’s screen buffer (or back buffer). Now your code is free to draw whatever it wants with XNA knowing that the output from OpenGL’s rendering is already there. Something like that would be really cool if you could get it working. As far as native to framework calls – yeah, I’ll write a post about how to do the marshalling in general. How I physically did the code changes – manually. In fact, very few calls actually ended up needing a conversion. You see, the time consuming, tedious part is not the modifications for marshalling, but actually _checking_ all the functions to see _whether_ marshalling is needed in the first place. You can’t rely on simply running the project, and if it works, assume that all the calls are OK – it could coincidentally work nine times in a row and crash on the tenth. All code modifications were manual except for changing variables which happened to be keywords in .NET that aren’t keywords in native (such as the word “generic”) – there was no way I was going to type all that manually (there were sooooooo many uses of the word “generic” and “new”). I used VS’s search/replace to quickly check where the violations were and change them if necessary. Timor – Sorry, I should have been clearer in my comment; by mixed-mode I simply meant using the “/clr” option without “pure.” I didn’t mean having native x86 code mixed into the .NET binaries – in that case, I agree with you, there would be performance penalties. I just meant keeping things like “structs” as-in instead of converting them to “ref class” objects. Regular “structs” are converted to value types anyway if you look at the disassembled IL code – they are _not_ kept native. I believe these are faster than ref classes. Kevin – I think it’d be cool to see a C# version using XNA. Does XNA support C++/CLI? Sorry if this is a stupid question, I thought it did, but doesn’t seem to after reading some stuff on google. An interesting challenge would be to take the C++ code and convert it to VB.NET. VB is constantly referred to as a “toy” language when I think the fact of the matter is it really depends on the programmer and the skill level involved. Brilliance can be expressed in any language; programming languages are just tools after all. 1) It would be very interesting to see performance differences going from C++ to VB.NET with such an involved and complex program. Today’s hardware is so powerful; it would be very interesting indeed. 2) There aren’t many sophisticated or cool examples written in VB.NET. At least not of the magnitude I’m proposing above. You’re more likely to find “experimental” stuff in VB6 (blah). VB.NET and VB6 are night and day, and the former is on par with C#. This would be an interesting exercise for all parties, particularly VB.NET developers who don’t always get the learning experiences they should. Tyler – I hate to say it, but I actually agree. Basically, if I were to do a C# port (something I’m considering but haven’t come to a hard decision yet) then it would not be too difficult at that point to port it once more to VB.NET (compared to going straight from C++/CLI to VB.NET). Seeing how things performed under VB.NET would indeed be interesting. I compiled all in the right directories but the console says that default.cfg file can’t be loaded. You’re running the shareware demo version of the game. It will not work with the demo (see “Get the Source Code” section of the post for an explanation). more seriously, I really like to read this kind of news in the morning and I am looking forward to see a port to C#. And also, now I have the retail version of Q3 but It still wont the default.cfg file. First, make sure the build configuration in Visual Studio is set to “Debug” or “Release” – there are other’s like “Debug TA” (Team Arena Debug) which you don’t want. If you haven’t done so already, try installing Quake 3 under “c:\quake3” – the same directory I used for debugging. If trying those two things don’t work, then paste your Q3 log again so I can take a look. Does anyone have a copy of the built files, I do not have visual studio to create it. But when I join a localhost game, single or multiplayer, the map textures are missing. i only see the crosshair + items and effects repeating over and over as I move around. what did I do wrong 🙂 ? This happens when the DLL’s can’t load. Pull down the console (with the “~” key) and you’ll see that the QVM’s were loaded instead. Check the baseq3 directory in the Q3 installation folder and see that all three DLL’s are there – qagamex86.dll, cgamex86.dll, and uix86.dll. On my computer this is “c:\quake3\baseq3.” The project settings are made to output the DLL’s there, or the root (c:\quake3) if it’s a debug build. Try setting your Q3 installation to this directory and do a full rebuild. Let me know if this fixes it. my first problem was the _getcwd function used in win_main.c. it always returns my development (source c:\dev\cpp\quake3\code) directory instead of the directory from where quake3.exe is started (c:\quake3). i rewrote the functions using _getcwd (dirty) to return c:\\quake3 as cwd. the port works fine, also creating and joining games. if i just start quake3.exe i get the same behaviour as while debugging from visual studio. so i think my other problem has todo with how visual studio starts the quake3.exe when i start the debugging. Yeah, if those command line options aren’t used, Q3 will load one DLL at startup and then use the QVM’s after launching a game. I should have taken out QVM support completely when doing the port, but oh well, too late now. So try it with those two changes and let me know how it goes. those settings make sense of course 🙂 i just didn’t think of setting them. This is a great project. It had occurred to me that I should attempt this a year or so ago, but I quickly decided it was far beyond my level of ability. Do you have any plans for the project in the future? Perhaps you could develop a simple extension manager that allows modules written in pure CLR languages to be loaded that contain game logic and other such functionality. This way uses could interact with the engine in C# and VB.NET amongst others. Yes, there are plans for the future. In fact, an extension mechanism like the one you described is already in the works. Although it’s just in the beginning stages right now – I’m laying out the architecture and deciding how the extensions will work from a modder’s point of view (figuring out what is the most useful design). If you have any suggestions on how you’d like to see the extensions work, let me know. I imagine that the task of designing the extension architecture is much more complex and time consuming than the task of actually implementing the code. I’m no expert on the matter but I have a couple of suggestions: I think that the extensions should be able to ‘hook’ functionality from the game engine. When the extension applies this hook, all the data that would have passed through the original engine function is passed through a local function within the extension code. The developer then has the option of either modifying the data (which would be passed as function arguments) and then allowing the original function in the game engine to execute (this would allow for slight modification) OR they can choose not to execute the original code and implement their own code entirely. This could completely alter the behaviour of the original function. For instance, developers could hook the behaviour routine for a certain weapon, and make slight modifications, or they could entirely replace the original behaviour. It may also be wise to add support for the game’s event messages and similar features. Apologies if none of this made sense! Actually, you made perfect sense! 😉 Thanks for the input. Changing the code to support /clr:pure would be about the same amount of work as doing an entire C# port. I’d rather use that time to actually do a C# port. Thanks for the great port. I am having a problem however, I want to use custom ui scripts as well as create a small team based game but if you try to compile with the Debug TA or Release TA, you get various errors and warnings. However, If you just compile the plain stock code, it’s fine. Will the Team Arena / Mission Pack code changes be made? TA wasn’t ported, just regular Quake 3 Arena. I don’t have any plans right now to change that part of the code. Actually, the TA portion is rather small and should be pretty easy for you, or anyone else, to convert. Turning on the Debug TA or Release TA configuration simply adds about five percent more code through #ifdef’s. If you want to try and get TA working yourself, I can certainly help you if you get stuck. I don’t think any algorithms would need to change, and I also don’t think TA adds any new data structures (but it does modify some existing one’s). So it should be pretty straight forward. Thanks for the reply. I actually came across a site that has some code for using the ta style menu without having to use the ta/mission pack stuff. Just curious. Do you do anything with OpenGL and GLSL shaders? I’ve found on implementation in another q3 engine but I am unsure if that hard coded (Evolution Q3) version is the best way. If you search for q2e or Quake 2 Evolved at sourceforge, you can find in svn the Q2 Overdose source which contains doom 3 style shaders. I am interested in getting glsl shaders working in this code but while there are a ton of pre-written shaders, there seems to be no updated code examples for loading the shaders. If you have any ideas or if anyone has any links, I’d like to see them if you’ll email me at the addy above. No, there are no GLSL shaders in the Q3 code. Was going through the code and checking out Nvidia’s NVSG and thier OpenGL SDK 10. I starting working on some implementions when I noticed some code that didn’t seem to be actual C++ code. I was thinking that this was a complete C++ rewrite of the quake3 code? Is this just a conversion to compile with .Net? I see the one line above with your comment. But the rest of the code is unchanged? This has me a bit confused. The latter code is from a partial conversion of the Q3 code. I may be misunderstanding the differences with managed c++ .net code. It just doesn't look like any of the c++ code that I've found. First off… fantastic job you’ve done here. I’m a real novice when it comes to c++, but following your tutorial, from downloading VS 2008 c++ express edition to configuring the environment… I can now debug the game with breakpoints and have made some changes here and there (albeit very small ones!). I have a requirement to make the game work so that the cross-hair that always appears in the middle of the screen actually moves around the screen and can be used to aim at objects. So, in essence the mouse would control the ‘hand’ of the player and would not change the players orientation (‘head’ position). I’ve found the code where it’s possible to comment out the bit that moves the orientation of the player via the mouse… which is a start… but I have no idea how to get the cross-hair moving around the screen … Would it need to be an entity that’s drawn on the screen and moves according to mouse movement? Then every time a weapon was fired you’d pass it’s coordinates in as what you were firing at? Any help to push me in the right direction on this would be greatly appreciated! Thanks again for doing this work, it’s really opened up a new world for me here. In C++, you can only do this if “qtrue” is the same type as the variable you’re flipping. If it’s not, you either have to use regular “if-else” logic, or typecast the right operand. In the Q3 source, there were some places where doing a typecast was not appropriate and I had to expand it into “if-else” logic. Type compatibility was also a big thing going from C to C++. You’ll find hundreds (probably thousands) of typecasts that weren’t in the C source. Another not so obvious code change was the fact that John Carmack used variable names that were keywords in C++ but not C. Such as “new”! I think there were something like 2,000 lines that used a variable called “new” which I had to change to some other name. Going from native C++ to .NET C++/CLI was also a big thing. Again, there were keywords in C++/CLI used as variable names, such as “generic.” C++/CLI is more strongly typed than native C++, so that generated a lot of compile errors. Then there were some things that simply didn’t work in C++/CLI for some unknown reason. I’d debug for hours, find whatever block of code was causing the problem, rearrange some logic, and then suddenly things would work. Go figure! There was even one block of code which I removed entirely, but it didn’t seem to have any negative effect on the game (this code was doing sound processing). So to answer your question, no it’s not a pure C++ rewrite – in that case, I’d change all the structs to classes and use some object oriented design. But it is a C++/CLI port so the executable is true CLI bytecode. You can use “ildasm” on the “quake3.exe” file and disassemble the executable. Greg, if you want to start a C# port. I’d be willing to assist. I’m sure others would too. I’m not clear on how you want the cross-hair moved on the screen. Do you want to have a linear relationship between the mouse movements and the cross-hair bitmap (just like a 2D game)? Or do you want the cross-hair to appear on whatever object the weapon’s trajectory-line intersects first? In other words, do you want it to act like a laser-pointer shining on a wall? That’s awesome. Let’s talk more. Please email me privately through my Contact page. Thanks. Well, after looking through the code a bit more, I managed to get the crosshair moving in a linear fashion as you stated in your comments. Basically I realised that the crosshair was moving in the cGame, ie. on the client but not on the server. What I’m trying to achieve is having an entity that exists on the server (lets say it’s in the shape of a hand for arguments sake) that will be controlled by the users mouse. So, in effect you could move the hand and if it ‘touched’ a wall or something else an event would be raised. I hope that makes some sense? Any help is appreciated! Great job working on this, it must have taken quite a while. I’m having the same issue as Enrico was where quake 3 can’t find the default.cfg file when the game tries to load in console. I am pretty sure that I have the full version of the game (since it isn’t 46MB it’s a few hundred megs(+/- some mods that I have installed)). I’ve tried moving my baseq3 folder into the /code directory and the game loads… but it doesn’t completely work correctly (missing items from menus, random freezes, etc.). 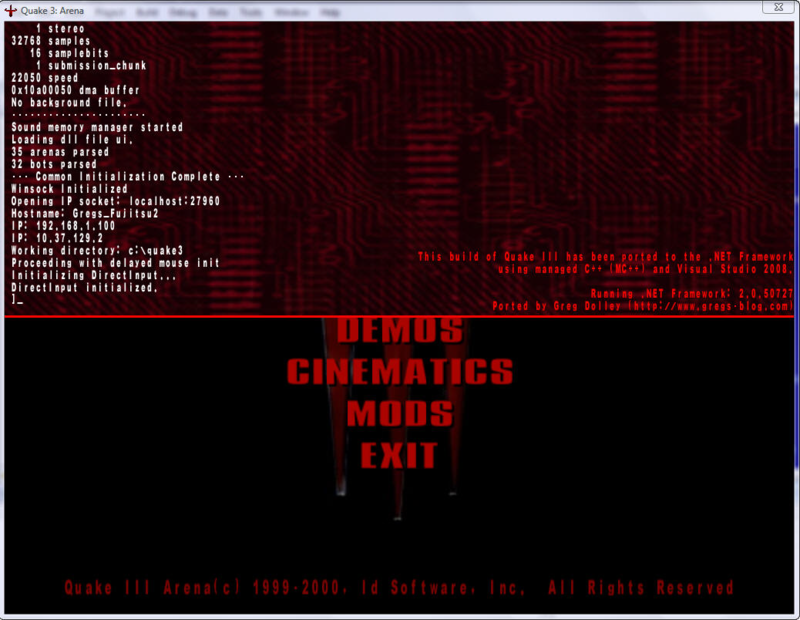 I figured since it was looking in the C:\quake3\code directory for ‘baseq3’ I may as well try it. I think you’re forgetting one very important factor. How far away is the “hand” from the camera/player’s viewpoint? Can it move closer or farther away? In order to determine whether the hand has hit a wall, its z-coordinate will have to be considered. If you somehow allow the user to control the z-depth (maybe with the mouse wheel), then you have enough information to calculate the trajectory vector from the camera to the hand. I know there’s an existing function (probably starts on the client and ends up in the server code), that takes a 3D vector as an argument and returns what entity the vector would have hit (either another player, a wall, sky, etc.). You may want to look into this. That symptoms you describe come from Q3 not being able to find the game DLL’s. If it couldn’t find default.cfg, you wouldn’t even get in the game at all – it’d simply error on that blue startup dialog. First off, you don’t need the “code” directory in the quake root. I keep my code in a totally different directory, even on a different drive. So I’d move the code directory out of there just to avoid confusion. Second, try copying the three game DLL’s (qagamex86.dll, cgamex86.dll, and uix86.dll) into “c:\quake3” and “c:\quake3\baseq3.” The quake3.exe should be under the root (c:\quake3). I suggest copying to both places because the Debug build looks under the root, while the release build looks under “baseq3” for those DLL’s. If you’re launching from Visual Studio, make sure “c:\quake3” is set to the working directory and that those command line arguments are also set in the “quake3” project of the solution. I donwloaded your source code and I don’t see single managed class in the code you “ported to managed code”. Can you point me to any class in the souce code which uses __gc or __value keyword which is necessary to create a .NET managed type. What objects/memory in ported code is managed by .NET garbage collector? What I think you did is that you created a mixed asemblies ( see http://msdn.microsoft.com/en-us/library/x0w2664k(VS.80).aspx ) which I believe contain mostly “unmanaged machine instructions” and no managed code apart from what Visual Studio compiler links into mixed assemblies by default. You’re forgetting that the original source code didn’t have any classes to begin with – there aren’t any classes in C, so there are no objects for the GC to manage. I think what you meant to ask was: why didn’t I convert all the struct’s to ref’s? Simple: pointer arithmetic is done on virtually every type at least once somewhere in the code. You can’t do pointer arithmetic on managed types unless you use a pinned pointer or interior pointer. But therein lies the problem: you can’t declare a pin_ptr or interior_ptr on an entire object, just members of the object (don’t confuse this with the object’s handle – you _can_ declare a pinned pointer on an entire object’s handle, like: pin_ptr – but this still doesn’t do you any good; you need a byte pointer into MyClass’s managed memory space). And rewriting every part of code such that it doesn’t require pointer manipulation would be akin to rewriting the entire codebase. If anyone has the time to convert every struct to ref’s, take out all the pointer arithmetic, convert all native-style arrays to managed “array’s”, etc. then it’s better to do a port directly to C# – it would take about the same amount of time and, in either case, 90% of the code would have to be rewritten. About mixed assemblies: they’re definitely not native machine instructions mixed in with a little managed code. It’s actually just the opposite – mixed assemblies is the default type (/clr) if you start a C++/CLI project from the wizard. The compiler will try to make everything IL code, even native types, and if it can’t, it’ll thunk it to native. To force the compiler to make everything IL code and only do native thunking for native DLL calls, you use the /clr:pure option. To force absolutely everything to IL (not even native DLL calls are allowed), you use /clr:safe. I suggest you take a look at ildasm’s output for quake3.exe or any of the three game DLL’s. I’m not sure how it works under the covers, instead of metadata there’s some custom table lookup thingy being used from the little I could understand with quick look in the spec. Most of the work I had going from /clr to /clr:pure was resolving few ambiguous refs that came up in linking and adding some glue for callbacks going into C-libraries. The “implicit pinvoke” ijw interop thingy works great except for when you create function pointer in clr:pure code, pass it to native lib that then calls it. It took couple additional lines of code per callback to clue the compiler into what was supposed to happen. Wow, this is cool man. How is the performance under .NET compared to pure C++ exe? Do you have any benchmarks with FPS? That would be interesting! Sorry for the delay. Been too busy…. So, in other words, there’s really no way to get an apple’s-to-apple’s comparison given that the retail Quake 3 game uses QVM’s instead of DLL’s. If you were to recompile the retail Quake 3 source and disabled the QVM’s – using pure C++ DLL’s only – then it’d be a fair test. YAY! This is so cool, a C# port is cool too with capabilities for other rendering API like XNA,SLIMDX,TAO in windows and MONO+TAO in LINUX, ;)). Guys i would like to inform all of you about a new release quake 5 arena!!!!!!!! coming soon march 2010 all same weapons better graphics new maps new feel to the game its going to be amazing. Yes, it’s down. I’m moving servers, but my new provider is taking a while to set up the new hosting account. Go to my Contact page and send me an email. I’ll reply with the zip attachment. When I seem to run the game on another computer without VC++ 2008 on, It doesnt seem to work. I get the error “This application configuration is incorrect.” Or something similar like that. Some people solved this problem they said, by installing the Redibs Package, But when i installed it and Re-booted, It showed me the Exact same error. I even tryed installing VC++ 10 on and it still showed me the error. I’ve posted in numerous forums, but people are just saying “Oh, your making a game! ?” Like what the hell? So I was wondering if someone on here had the common sense to help me out, without saying the bit on the quotes. Vlad – hmmm, common architecture, that’s a tough question. Besides the graphics engine part, the rest of the game code is really just a code interpreter that’s designed to run mods. The original Quake 3 game is in itself just a mod. That’s why you see little variants of Q3, such as capture the flag, that can change the original game without using a different exe. I try to compile your solution with Visual Studio 2010 and with DirectX SDK of february 2010. This is supposed to use DirectX, is it not? Then why am I still getting errors about the loading of OpenGL? This is worrying seeing as I don’t have a card that supports OpenGL. No, Quake 3 uses OpenGL for graphics. The only DirectX being used is for keyboard/mouse/peripheral input.